Before I started uni, my makeup was very minimal. You'd never see me sporting a bold lip and the most adventurous thing I'd wear was pencil eyeliner on the waterline. I loved the idea of makeup but my application skills didn’t let me achieve the look I desired nor did I want to resemble a clown. Fast track to today, my foundation goes on smoother, my eyeliner stays put and the things that looked scary before are now part of my everyday routine. Being part of Beauty Aesthetic has given me a chance to try new things and step out of my comfort zone so I thought I'd share some products which I've been trying out to shake things up a bit! 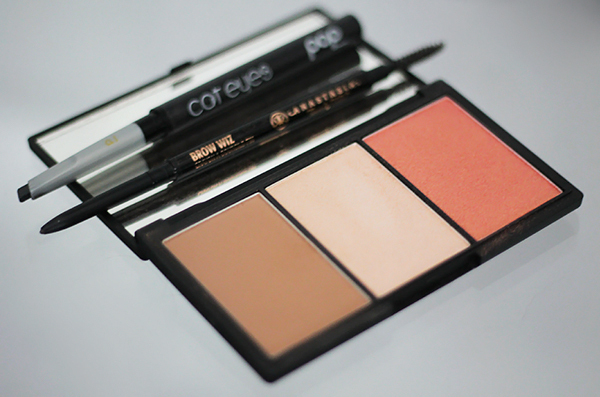 Everyday contouring is generally quite a new thing in the world of makeup. You see it all over magazines and pictures of celebrities but it’s been making it’s way into most people’s everyday routines. It’s safe to say Kim Kardashian is probably to blame! My issue with using bronzer and contour products is that with my pale complexion, most bronzers are too orange and don’t look natural on me. I've always wanted to try products from Sleek but it wasn't until very recently I picked up the Sleek Face Form Palette in Fair, which is the lightest shade in the range. It basically has a bronzer, highlighter and blush in one with a huge mirror for on the go touch ups. The contouring powder has a matte finish so it gives off a really lovely finish and it’s perfect for my complexion. It doesn't apply too heavy but you can easily build up the colour if you want to. If I'm honest, I could do without the blusher, it’s a little too shimmery for my liking, so if you're looking for a good bronzer, maybe the Contour Kit might be a better fit. I've always been terrible at keeping my eyebrows in shape, though having a side fringe means that they aren't on show too often so it’s the perfect excuse to hide them. A few years ago I'd have never used any sort of brow product but now I’d never leave the house without filling them in. Your eyebrows frame your face and filling them in makes such a difference. For a while I'd been relying on my HD Brows Kit which has been amazing at quickly filling in my brows. Now that I have the powder application down, I'd always wanted to try filling them in with a brow pencil but unfortunately it brings back memories of me trying to fill in my eyebrows with a bold black eyeliner, the horror! Instead of trying out your typical pencil I recently made an order to Cult Beauty and picked up the amazing Anastasia Brow Wiz in Medium Ash. Buying eyebrow products is hard enough so blind buying was a risk but it managed to pay off, Medium Ash is the perfect colour. The applicator is so fine that it makes filling your eyebrows in extremely easy. My main concern about using pencil eyeliner was achieving a natural finish but I actually found that it actually gave a much more natural finish than my usual powder. It’s safe to say once my HD Brows Kit runs out, Anastasia Brow Wiz is here to stay! Last but not least is eyeliner which is my biggest beauty struggle of all time. I've tried pencil, gel, liquid and all have completely failed me. I remember the one day I managed to achieve a passible line from using the Urban Decay 24/7 Liquid Eyeliner but sadly it hasn't been as good ever since. My eye shape is quite hooded, even if I wore a ton of eyeshadow it would be almost unnoticeable, so drawing on eyeliner has always been difficult. On a day of browsing around ASOS I discovered the POP Beauty Cat Eyes Eyeliner which makes achieving the perfect line much easier. It’s basically an angled eyeliner so you don't have to worry about positioning your pencil at the right angle. My only problem with it is that the eyeliner is still quite thick so it takes a bit of time to achieve a smaller line but hopefully with a bit more practise I’ll be sporting a cat eye in public soon. I still have a long way to go, especially with eyeliner. I really enjoyed trying out new things and encourage you all to do the same. Next stop, eyeshadow!